A Bride’s Mafia Moves to Convenient New Home in O’Bryonville! 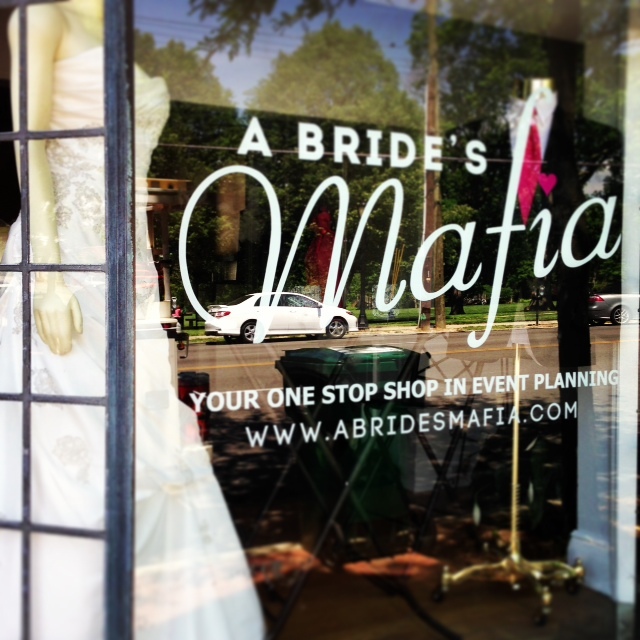 A Bride’s Mafia just moved to a brand new space in O’Bryonville – a more convenient location for people who are coming in from Northern Kentucky, downtown or the Eastside! And they’re all about convenience because A Bride’s Mafia is a one stop shop for you to meet all of the best wedding vendors in the city all at once! If you or someone you know has a wedding coming up, call or stop in to schedule your complimentary consultation! By joining the “Mafia” you get these consultations, access to exclusive vendors, and invites to their amazing events! Cincy Chic also covered them a couple of months ago to give you even more info on A Bride’s Mafia. Click here to check out those stories and click here to learn about their fun “Battle of the Wedding Bands” event coming up in August! Their new address is 1985 Madison Rd. Cincinnati, OH 45208 so make sure you stop by and visit! Owner Nidhi Bedi let me sneak inside and get a peek! So, I snapped some great pictures (using my phone’s cool new panoramic setting!!!) of the shop so you can see how amazing it looks! lur apparel just launched a cool campaign to find and recognize sustainable leaders working to benefit people and the planet through their 2013 Sustainable Leader Award. The award includes more than $1,000 in prizes including a cash grant for the cause of the winner’s choice! Nominations for the award will be accepted until March 15. Click here to learn more about the campaign. 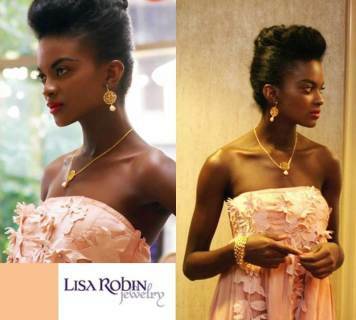 lur apparel is actually the fashion show sponsor for our Eco Fab Fashion Show on March 15. The event, hosted by my team at Cincy Chic, will feature eco-friendly hair, makeup, styling, fashion show, several pop-up boutiques to shop at and fundraisers for the Civic Garden Center. We’ll even have a workshop area where you can learn how to make these super awesome “no-sew infinity scarves” pictured below! Tickets to the event are free and you can RSVP by clicking here. Brunch & Bling March 9th! 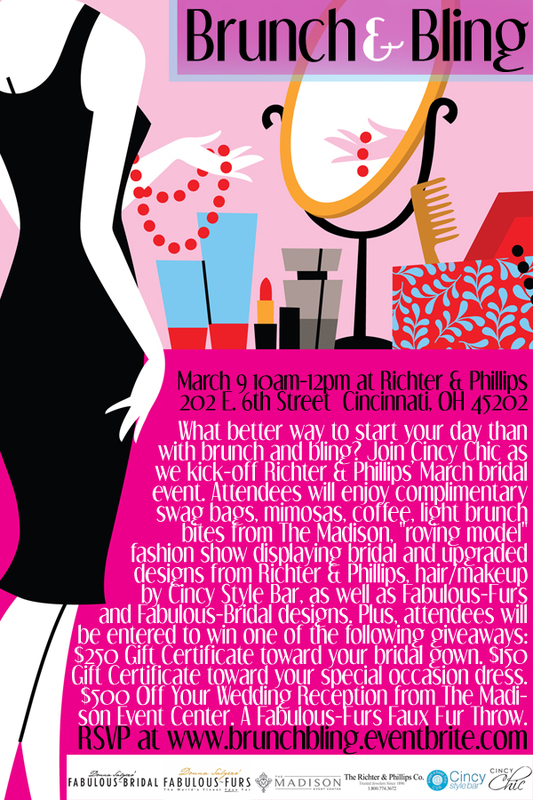 Cincy Chic will be throwing a Brunch & Bling event on March 9 from 10am-12pm. I’m really excited about this event because I’ve always wanted to do a “Breakfast at Tiffany’s” event. 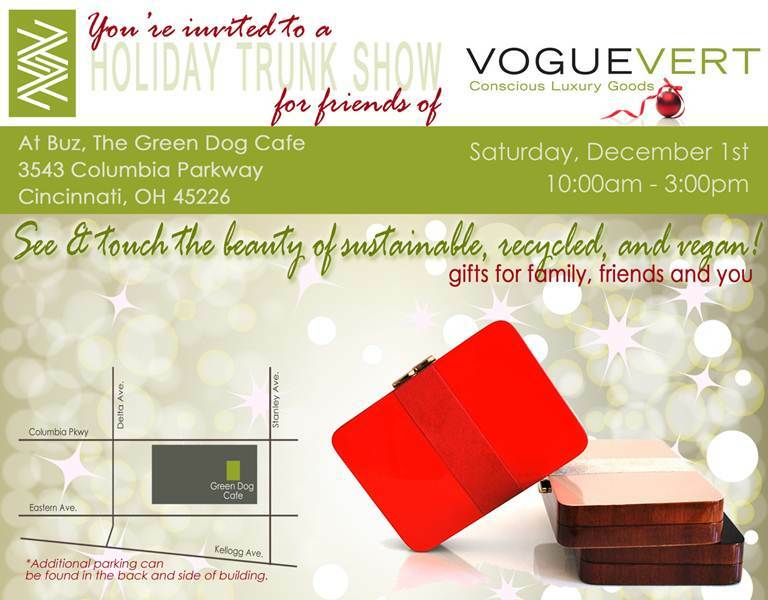 There will be brunch, shopping and a fashion show using all local retailers! Brunch & Bling will be held at Richter and Phillips at 202 E. 6th St. in Cincinnati. Attendees can enjoy complimentary mimosas, coffee, light brunch bites from The Madison, “roving moving” fashion show displaying bridal and upgraded designs from Richter & Phillips, hair and makeup by Cincy Style Bar and Fabulous-Furs and Fabulous-Bridal designs. This is a free event, so I hope all of you can come! This is going to be a fab way to kick off the weekend! Click here to RSVP! Eco Fab Fashion Show March 15th! 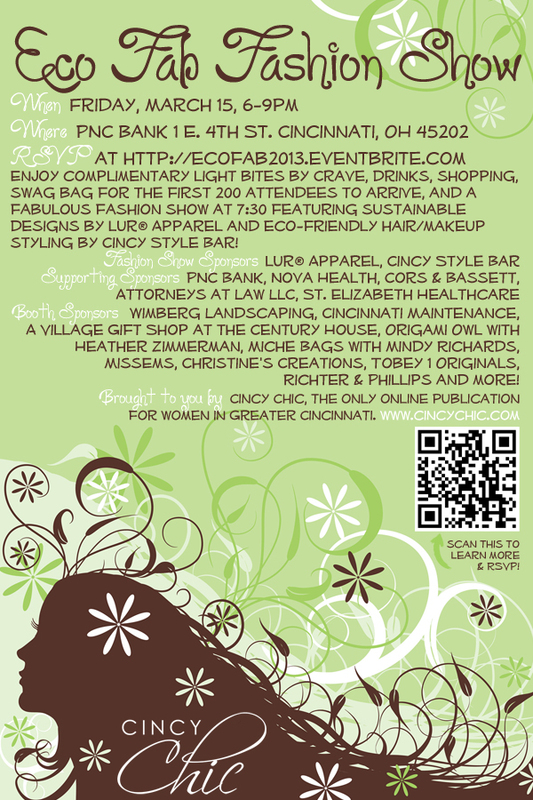 Over at Cincy Chic, we’ll be having our 2013 Eco-Fab Fashion Show on March 15. The event will be from 6-9 p.m at PNC Bank on E. 4th St.
Complimentary light bites by Crave and drinks will be served. 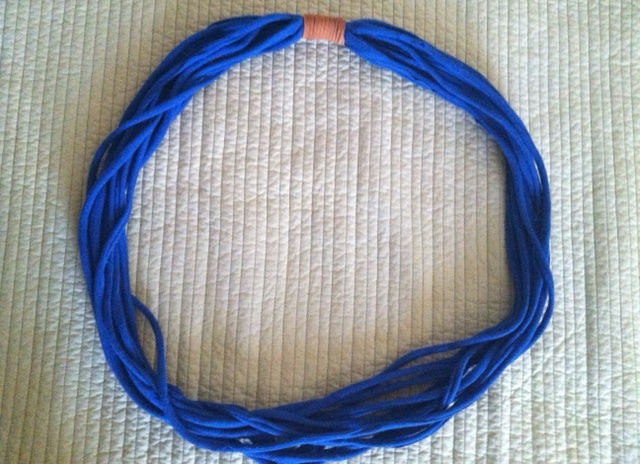 Lots of shopping will also be done and the first 200 attendees to arrive will get a swag bag! The fashion show will start at 7:30 and will feature sustainable designs by lur apparel and eco-friendly hair and makeup styling by Cincy Style Bar! Fundraising activities for the Civic Garden Center will be available during the event as well as an “Eco-Fab” workshop area where attendees can turn their old t-shirts into no-sew infinity scarves! The event is free to attend so click here to get your free ticket! Attention Brides-to-Be: Folchi’s Shopping, Makeover Event Feb. 26! Get ready to celebrate the upcoming wedding season in style! Folchi’s is inviting you to a fun and informative event called Cupcakes & Cocktails! On February 26, from 5-8 p.m., the adult only event is being held at 7344 Kenwood Road in Cincinnati. Guests will get to view the latest collections for grooms and will get special discount offers during your visit! Personal stylists will also be on site to offer services in helping you find the perfect outfit for the groom’s special day. Mini makeovers by Jean Folchi Makeup Artistry will be available as the icing on your cupcake and to offer tips for looking dapper on your big day! Featured vendors include Jean Folchi Makeup Artistry, Cupcake Crazy and Kim Claire Photography. Space is limited to make sure you RSVP soon! Click here to save your spot!